Now, this is another festival Indians go crazy about. 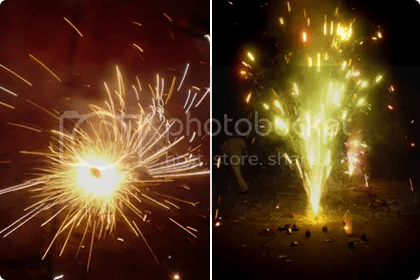 Fire crackers, sweets, gifts (oh yeah! ), dry fruits, rangoli, new clothes (yet again!) and more sweets! Plus, Bengalis have their Kali Puja the very next day. So we just have to let go of watching our blood sugar levels for the two days. It’ll be difficult for anyone to find a town, city, suburb or countryside free of noise, colors, light, fumes from the fireworks or plates and plates of badam burfi piled high. Indians don’t celebrate with food – they celebrate food itself. Every festival in India is always up for a million dollops of pure ghee, barrels of molasses, milk by the gallons, saffron by the fistfuls, nuts and fruits by the kilos. Some of the concoctions melt in your mouth, some fill you up with the first serving, some you get addicted to, some taste strange, some reminds you of something ancient and historical, some burst with flavor, others are subtly strong – but all of them make your mouth water, frankly. This year was slightly different for me. Well OK, a lot different. Firstly, it rained cats and dogs day before yesterday, which was a mood-killer. The dampness not only affects the performance of the crackers (obviously), but it dampened all our spirits. 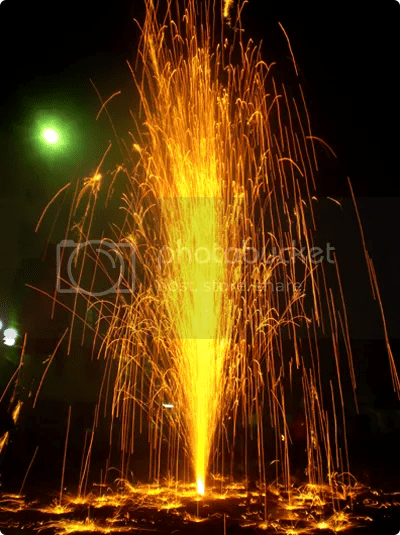 The fireworks industry in India is massive. And for a day the dealers sat with their hands holding up their heads! Secondly, I cut down on the amount of crackers. Well, because after 20 years of experiencing fascination and borderline obsession with fireworks, I got bored this year…much to the surprise and shock of my family and friends. Thirdly, because I made sweets. And not the traditional burfi or kheer or halwa. But, I made truffles. Yes, you read that right. Truffles. Gorgeous dark chocolatey, walnutty ones. All for a mid-morning coffee snack! And for two very special gift-packages. Recipes are right at the end of this post. 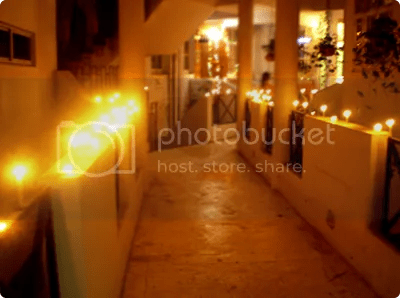 Evening was spent lighting lamps and diyas all throughout the house. And the rest of it was spent inhaling the fumes of burning nitrates and carbonates! Anyway, back to the aforementioned truffles. I’ve been obsessed with them since……well, since Sunday. That’s when we were gifted this gorgeous box of six sinfully chocolicious rum and brandy truffles! Too bad, none was left to photograph. So, I made some of my own with walnuts, considering the fact that we have a whole kilo of walnuts leftover from when I made cookies a week back. 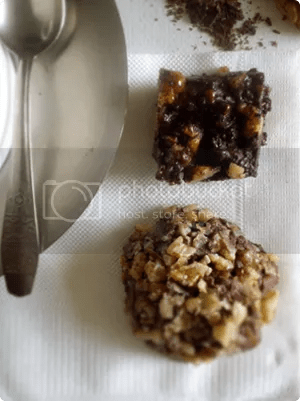 Chop up the chocolate in shards and chunks and put all of it in a bowl. Heat the cream till it reaches its boiling point. Be careful not to let the cream boil over, at this point. Pour it over the chopped chocolate and let stand for a minute. 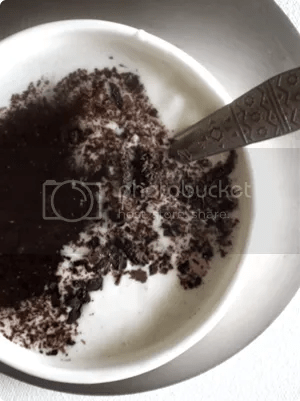 With a whisk or a wooden spoon start stirring the cream-chocolate mixture, from the center towards the sides of the bowl. Mix thoroughly till all the chocolate has melted. We don’t want any streaks of cream either. What you have now, is chocolate ganache. 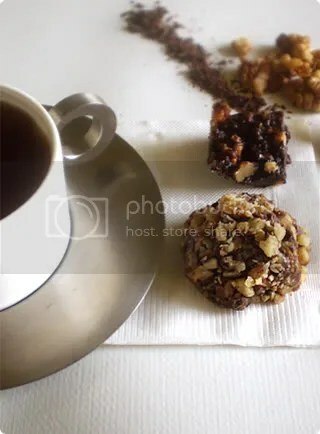 Pour in a shallow bowl/tin lined with aluminum foil and chill in the freezer for 2-3 hours or till a tablespoon of it can be rolled into a ball. After the ganache has set, spread the chopped walnuts on a plate. With a teaspoon (or one of those rare melon scoopers, if you have any) scoop out some and start rolling into a ball. The consistency of the chocolate at this point should be such, so it doesn’t stick to your palms much. Roll the balls in the chopped walnuts till they’re coated evenly and pop all of ’em into the freezer again for about an hour before trying any. Walnut Rock Truffles with extra crunch! Chop the chocolate. Add butter to it and melt on a double-boiler. Meanwhile, combine the walnuts and sugar in a bowl. Start adding the egg white to the mixture slowly to make a dough. You won’t be needing all of the egg, since we want the “dough” to be sticky and disintegrated. Take the chocolate off the heat and add the vanilla essence. Now, my essence was too strong for my taste, thats why I only used a few drops. Go ahead and add a few drops more, if yours is milder. Add this melted chocolate to the “dough” and mix well. Pour (or spoon, rather) it onto a plate lined with aluminum foil and chill in the freezer for 2-3 hours or till you can cut it into pieces. I love that these recipes contain not too many ingredients. Your pictures are beautiful too! Strange weather all around the world I guess. 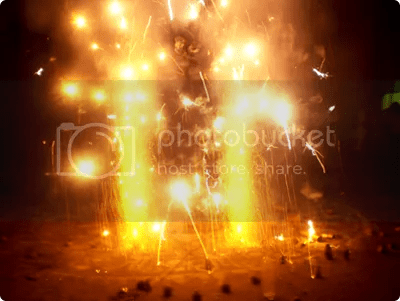 I still hope you had a good Diwali…nice fireworks shots there, I miss doing those & rangoli! I miss playing with fireworks. We used to get them in Japan when I was young. Most firework (and certainly the fun ones) are illegal here in NY. The truffles look great! the truffles look divine and the ingredients minimal. happy diwali! i’ve given you an award on my blog. thank you so much for being such an inspiration. Thanks for visiting over at my site. I’m really learning a lot through reading food blogs from all over the world. I’ve never heard of Diwali until I read of your site. Great work with the truffles!